In “The Filipina's Breast: Savagery, Docility and the Erotics of the American Empire,” Nerissa Balce powerfully argues that “the bare brown bosoms of indigenous women were markers of savagery, colonial desire, and a justification for Western imperial rule. A foundational project of European and American imperialisms was the creation of an archive of images of the non-Western other whose inferiority was marked by female nakedness” (Social Text 24.2 [Summer 2006], 89). These gendered, sexualized, racialized images conflated women and land as imperial possessions and legitimated US (and previously Spanish and Japanese) civilizing missions. Nor was this representation limited to women: Filipino men—albeit according to different tropes—were also archived by empire as gendered, sexualized and racialized objects. 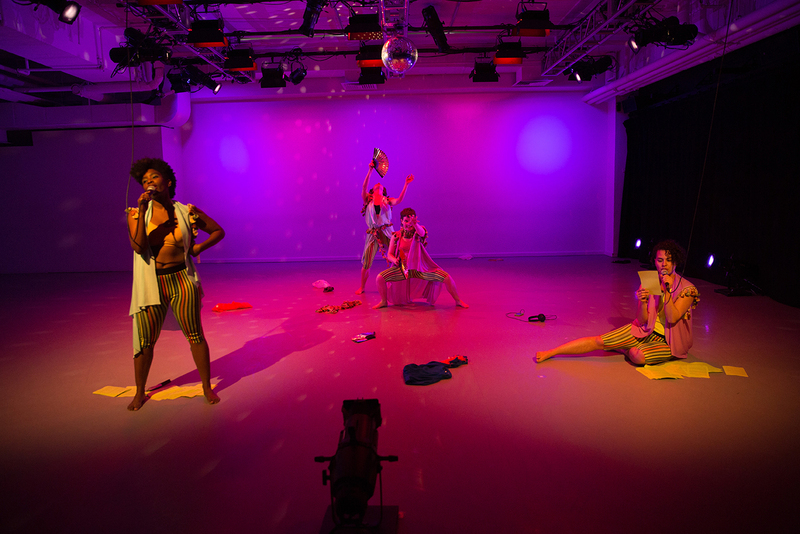 In taking “genders and sexualities” as a topic, we gesture towards not only the complications of contemporary negotiations and constructions of “masculinity,” “femininity,” “heterosexuality,” “homosexuality” and their many local and global iterations but also to their inevitable entanglement with the histories of colonialism, imperialism, militarization, globalization and capitalism. 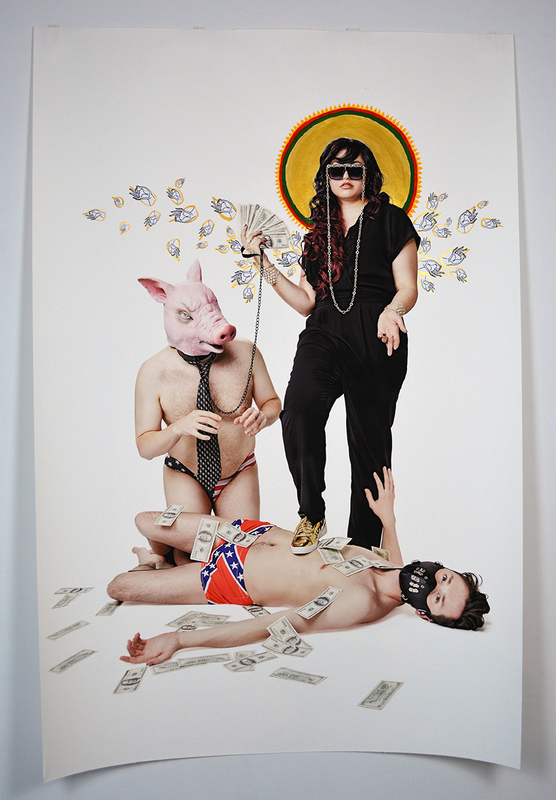 Anida Yoeu Ali is an artist, educator and global agitator. 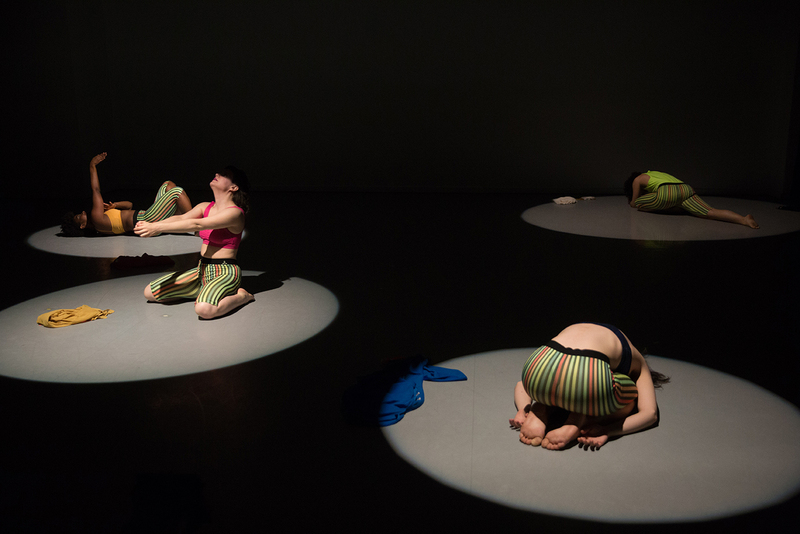 Ali’s practice spans performance, installation, videos, images, public encounters, and political agitation. 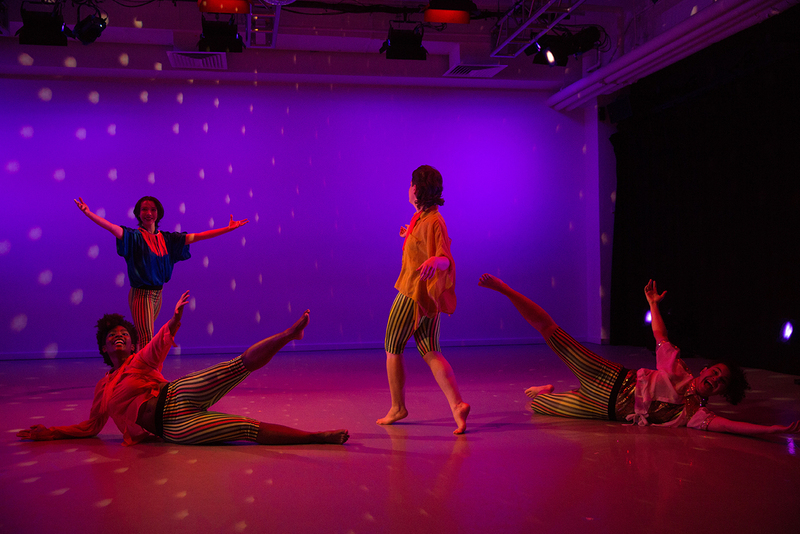 Utilizing an interdisciplinary approach to art-making, her installation and performance works investigate the artistic, spiritual, and political collisions of a hybrid transnational identity. In 2015, Ali won the top prize of the Sovereign Art Prize, Hong Kong. Her work is exhibited internationally, most notably with the Smithsonian Asian Pacific American Center, 5th Fukuoka Asian Art Triennial, Lyon Museum of Contemporary Art, Palais de Tokyo, and the Asia Pacific Triennial 8. She is a collaborative partner with Studio Revolt, a trans-nomadic artist-run media lab whose controversial works on deportation have caused White House interns to be fired. Ali earned her B.F.A. from University of Illinois (Urbana-Champaign) and an M.F.A. from School of the Art Institute Chicago. She is currently the Artist-in-Residence at the University of Washington, Bothell where she teaches art, performance, and global studies courses. Ali resides in Tacoma and spends much of her time working between the Asia-Pacific region and the US! My artistic vision requires an element of risk and belief that performance art, humor, and religion can fuse conceptually and aesthetically. Through an interdisciplinary approach, my work maps new political and spiritual landscapes. Often meters and meters of textile act as skin, as a way for the surface of my body to extend into public spaces, and as a metaphorical device for stories to spread across an expanse. 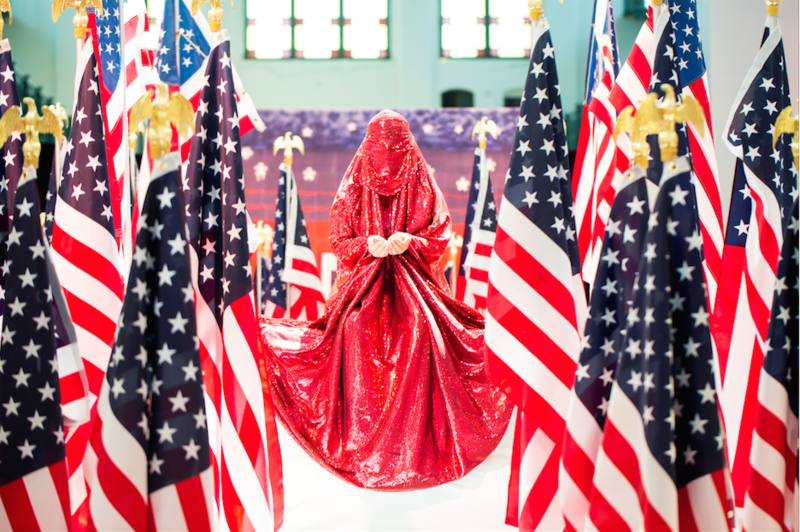 In The Red Chador: Threshold, performed in Washington, DC, I pose the question: Can we accept a Muslim woman as an American patriot? 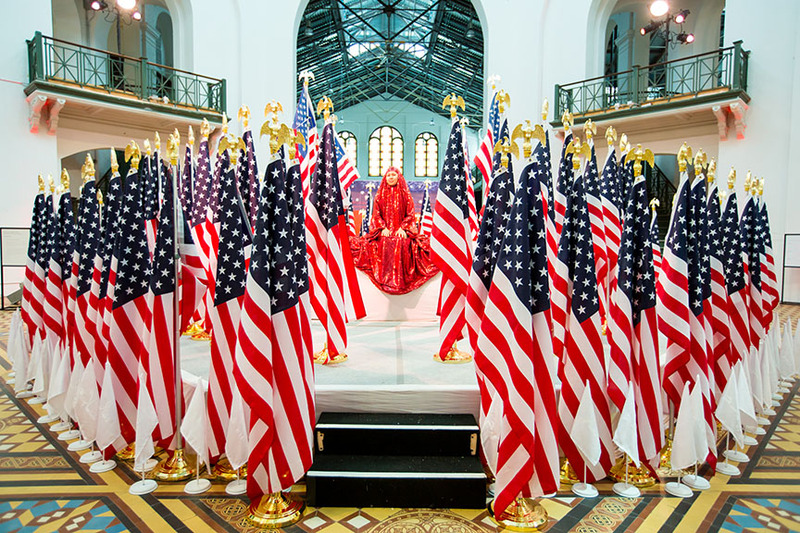 The Red Chador: Threshold was a commissioned performance for Crosslines Culture Lab and hosted by the Smithsonian Asian Pacific American Center. Covered from head to toe in a red sequined chador, I sat, stood, and walked silently around for eight hours over three days during Memorial weekend. For me, The Red Chador embodies how the mere existence of a Muslim woman can be misinterpreted in an era of heightened Islamophobia. For two days, I was installed in the building’s rotunda, where the Statue of America stood over a century ago at the Smithsonian Arts and Industries Building. Ninety-nine American flags as well as ninety-nine white flags printed with Salaam—Arabic for peace—surrounded me, challenging the idea that my Muslim and American identities are at odds. On Memorial Day, I took The Red Chador out to the streets of [Washington,] DC, walking amongst the everyday people at famous historical sites and memorials. Concurrent to my appearance, the Rolling Thunder annual motorcycle rally of veterans also rolled into town. Since 2015, The Red Chador has appeared in Paris, Hartford, CT; San Francisco, CA; Seattle, WA; Washington, DC; and Hong Kong. Duration: 21 min. 22 sec.